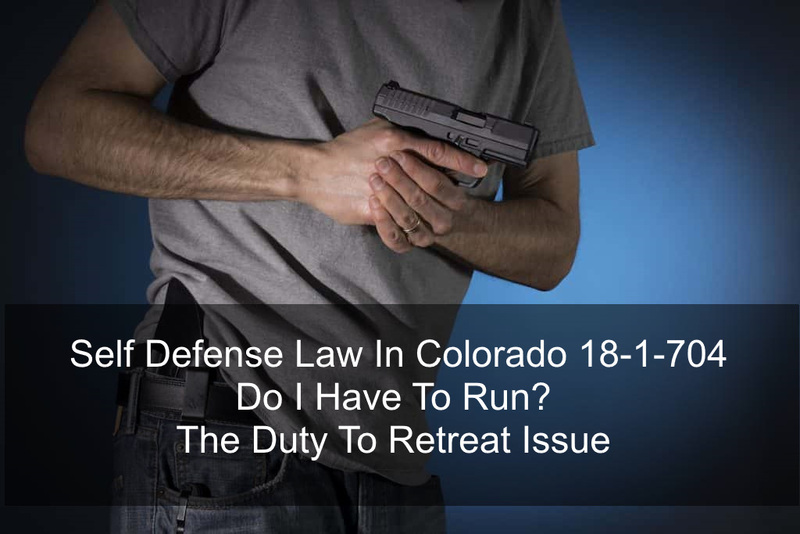 Self Defense Law In Colorado 18-1-704 – Do I Have To Run? – The Duty To Retreat Issue – Every state has their own version of self defense. There is much confusion in the media as to whether the successful assertion of self defense in one state would “work” a in another state. One question in this area surrounds the so called Retreat To The Wall – or Stand Your Ground doctrines. This article address these doctrines under Colorado law. 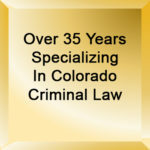 All Colorado criminal laws are found in, and referred to as, the Colorado Revised Statutes or C.R.S.. Among the most important of the rights that individuals possess in Colorado is the right to defend against serious criminal charges. In the arsenal of those rights is the right to self defense – known as an affirmative defense which, if successfully asserted at trial, mandates that the charge or charges are excused – in other words – the accused, the Defendant is exempted from criminal responsibility. While I have written on this subject before, because of recent events in Colorado, this article readdresses the confusion in this area. C.R.S. 18-1-702. Choice of evils. C.R.S. 18-1-703. Use of physical force – special relationships. C.R.S. 18-1-704. Use of physical force in defense of a person. C.R.S. 18-1-704.5. Use of deadly physical force against an intruder. C.R.S. 18-1-705. Use of physical force in defense of premises. C.R.S. 18-1-706. Use of physical force in defense of property. C.R.S. 18-1-707. Use of physical force in making an arrest or in preventing an escape. (c) The other person is committing or reasonably appears about to commit kidnapping as defined in section 18-3-301 or 18-3-302 , robbery as defined in section 18-4-301 or 18-4-302 , sexual assault as set forth in section 18-3-402 , or in section 18-3-403 as it existed prior to July 1, 2000, or assault as defined in sections 18-3-202 and 18-3-203 . Essentially C.R.S. Section 18-1-704, which “sets forth the circumstances in which a person is justified in using physical force” in defense of himself or another person and the exceptions to that privilege. Two major common law historical trends govern the privilege to use deadly force in self-defense. 2. The “no duty to retreat” doctrine. Colorado has historically followed the “no duty to retreat” rule at common law. Colorado does not impose a duty to retreat before a person may use physical force in self-defense. Common law is the system of law which is based on judges’ decisions and on custom rather than on written laws such as the Colorado Revised Statutes. Under American common law the rule is that a person does not have to try to escape before using reasonable non-deadly physical force to defend against unlawful force by an aggressor. (Wayne R. LaFave & Austin W. Scott, Jr., Substantive Criminal Law § 5.7(f). On the other hand English common law historically required the opposite approach. Under English common law a person had to “retreat to the wall” before using deadly force in self-defense. Under the “retreat to the wall” doctrine, a person is entitled to employ deadly force in self-defense only if the person demonstrated that no reasonable means of escape existed at the time he killed his assailant. One of the only exceptions under English common law was the doctrine that developed known as the “castle doctrine.” This exception, the reasoning which underlies Colorado’s Make My Day Law, allows a person in his own home to use deadly force in self-defense without first retreating even if a reasonably safe means of escape exists. Colorado does not join the several American jurisdictions that still apply variations of the “retreat to the wall” rule in self-defense cases. 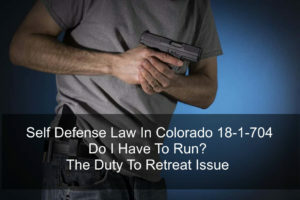 Colorado has taken the opposite track in contrast to the “retreat to the wall” doctrine, taking instead the “no duty to retreat” rule, or “true man” doctrine for the use of physical force in self-defense. (3) the Defendant has a reasonable fear that the victim is about to cause the defendant immediate serious bodily harm or death. There are, doubtless, cases where it is the duty of the party assaulted to retreat to the wall before taking human life, as, for example, where the case is one merely of simple assault, or where the parties engage in mutual combat, or where the defendant is the assailant, and has not in good faith declined further struggle before resorting to self-defense, or has provoked the assault with intent to commit a felony. Colorado courts have held that a Defendant “had the right to defend himself” when the passengers of the another car approached the defendant after colliding with his car. Under those facts the law does not impose on the defendant a duty to retreat. In another case, the Colorado courts have held that a person need not “retreat to the wall” where a man was attending his own business, in his own bank. He was not required to retreat to a position of no escape before using deadly physical force. Summary Of The Colorado Law Of Self Defense- Section 18-1-704 C.R.S. Colorado’s “Statutory Privilege” (arising out of the law enacted by the Colorado State Legislature) to use physical and deadly force in defense of a person has followed the common law’s “no duty to retreat” rule since at least as early as 1868. The current statute, (above) Section 18-1-704 C.R.S. Colorado’s expressly notes that the statute codified Colorado’s common law of self-defense, including the “no duty to retreat” doctrine. Colorado’s self-defense statute, (18-1-704) specifically defines the circumstances under which a person may use physical force, including deadly force, in self-defense. The right to use force in self defense is limited. The amount of force used to defend yourself must be proportional to the threat. The law uses the term a force that the person exercising the tight of self defense “reasonably believes to be necessary” to stop the attacker. A jury decides whether the degree of force used was proportionate or disproportionate under the specific facts of the case. It is the old bringing a gun to a knife fight issue. Using deadly force to repel deadly force would be considered proportionate. However using deadly force to repel a push or even a punch is not proportionate. This “reasonable” use of lethal force is the issue . In all states to use deadly force, you must believe that there was an imminent danger to your life or imminent danger of serious bodily harm. Section 18-1-704 C.R.S. defines two basic categories of persons who are not justified in using physical force under any circumstances. First, a person may not claim self-defense if the person, with intent to cause bodily injury or death to another person, provoked the use of unlawful physical force by that other person. See § 18-1-704(3)(a). Second, a person may not claim self-defense if the physical force defended against is the product of a “combat by agreement not specifically authorized by law.” See § 18-1-704(3)(c). There are NO exceptions that would permit a person fitting under either of these subsections to 18-1-704 (704(3)(a) or 704(3)(c)) to use physical force in self-defense. Coupled with the two categorical no right to self defense sections of the law who may never assert the privilege of self-defense to justify the use of physical force, there is a third category of persons, “initial aggressors,” who ARE requited to retreat before employing physical force in self-defense. 2. “[E]ffectively communicates to the other person his intent to do so, (but the latter nevertheless continues or threatens the use of unlawful physical force.”) Section 18-1-704(3)(b). Recently, the Colorado Supreme Court identified (under Section 18-1-704) the rights of four categories of persons with respect to the privilege of using physical force in self-defense. (4) all other persons, i.e., those who do not fall within the first three groups, may use physical force, including deadly physical force, in accordance with sections 18-1-704(1) and (2). See § 18-1-704. Colorado law actually goes much further in protecting the right to use self defense than many other states. Under Colorado law, the right to use self defense extends to persons who are in a place they have no right to be… such as a trespasser. While many jurisdictions include theright to be element as a requirement of the “true man” doctrine, Colorado does not incorporate the “right to be” as an element of the privilege. Put differently, the Colorado Supreme Court describes the reason why a person who is in a place they have no right to be as also having the right to act in self defense. Under Colorado law:] a victim of an attempted robbery who flees onto a third person’s property before resorting to physical force against the would-be robber. Nothing in the statute suggests that a robbery victim forfeits the privilege to defend himself simply by the act of trespassing onto the property of a third person. There is nothing in Section 18-1-704 or in Colorado common law (caselaw) that requires a non-aggressor who is entitled to use deadly physical force in self-defense to “retreat to the wall” before using such force, whether or not the person is where he or she has a right to be. H. Michael works hard to get his clients the best possible results in and out of the courtroom. He has written, and continues to write, extensively on Colorado criminal law and he hopes this article helps you in some small way – Self Defense Law In Colorado 18-1-704 – Do I Have To Run? – The Duty To Retreat Issue. Every state has their own version of self defense. There is much confusion in the media as to whether the successful assertion of self defense in one state would "work" a in another state. One question in this area surrounds the so called Retreat To The Wall - or Stand Your Ground doctrines. This article address these doctrines under Colorado law.